Simple factors like the temperature of your office can affect employee productivity by over 38%. By paying careful attention to our office space and thinking about the day to day experience of our employees, we can create places that people are excited to work in. Changes, like adding color or including a space to unwind, can make such a big difference in our mental state. An office remodeling offers a huge opportunity to do something special that will benefit your business and everyone who works there. Follow the office renovation checklist below and watch the smiles spread. It seems offices have gone from one extreme to the other in the past few decades. Older generations spent their lives in cubicles working in isolation until a colleague or boss walked over for a chat. These had unintended consequences of people speaking louder and spending time away from their desk just to see another human. The pendulum swung, and open plan offices became the next big thing. However, they’ve had their own share of problems with people reporting a lack of privacy and the feeling of being watched constantly. If possible, an office should offer both options. Quiet spaces where people can work alone in peace, and open areas where they can collaborate with others and talk. By giving people a choice, they can do what’s best for them at the moment and never feel forced into one way of working. Out of all the things that employees get the most annoyed by, the office temperature tops the list. It always seems some people are far too cold while others are far too hot. This can be due to many reasons from the location of the AC to how much sunlight is hitting and warming their area. The solution is to have the AC on as little as possible. If your office has proper insulation, once the office is warmed or cooled to the ideal temperature of 69.8 degrees, it is likely to stay there for a long period of time. People care about the environment and fortunately, environmentally friendly devices and appliances consume significantly less energy which adds up to huge savings over time. There has also been a huge shift into “paperless offices” where all documents, projects, and information is kept and shared digitally. This reduces clutter around the office and makes it easy to find files as long as you have an organized system in place. Doing this will improve people’s perception of the company, save money, and boost productivity. When someone has an assigned desk, it’s only natural for them to start leaving personal items around it and interact with those in their immediate area. ‘Hot desks’ allow people the chance to sit somewhere new and meet new people in the office. It also lets them learn about the wider goings-on of the business which creates opportunities for innovations and improvements. You also don’t have to worry about those who don’t like this style of work. If it truly bothers them, they’ll either let you know or make sure they get the same desk every day naturally. If your office is grey and beige, then you are literally making your employees feel sad and depressed. Colorful environments help people feel stimulated and happy. This doesn’t mean you have to throw rainbows all over the place, but having even just one bright, bold color everywhere can make a huge difference. Each color has it’s own reported benefits, (blue calms while red excites for example), so think about your business how it can be painted to best serve your employees. You can even change the colors depending on if space is used for quiet concentration or energetic social interactions. One of the best advantages that come with remodeling is the ability to rethink how light enters into each room. New architecture focusses on having big windows to let in as much natural light as possible. It also gives your employees nicer views to help your office space more beautiful. Work with your developer to see if you can place the windows to let as much light in as possible in the winter when the sun is lower and block direct sunlight in the height of summer. We all know that the daily grind is hard even if you love your job. Some days you don’t feel productive or feel down. Having spaces in your office that let employees unwind or blow off steam in the middle of the day can do wonders for their happiness and thus, their productivity in the long run. From relaxing hang-out spots which double as informal meeting areas to ping-pong tables, think about the space you have to work with and what will genuinely help. If you’re stuck, ask your employees what they would like. There are tons of all-in-one office systems which link meeting rooms to calendars and seamlessly connect to devices. For example, some employees can be walking past a meeting room and see that it’s empty. The display will tell them that it’s currently available allowing them to book it on the screen. This then updates on everyone’s calendar, so they know it’s booked. They then walk in, connect their laptop, and can control the room’s temperature, lighting, screen, and audio all at once. Systems like this make it easier for your employees to manage their time and have more effective meetings. Office remodeling should be an exciting process. The opportunity to create a wonderful work environment that makes people happy and work easier is in your hands. Do your best not to get sidetracked by useless, expensive gimmicks like granite countertops in the staff kitchen or uncomfortable steel chairs passed off as “chic”. Instead, think about the common discomfort experienced by everyone and how you can alleviate that. 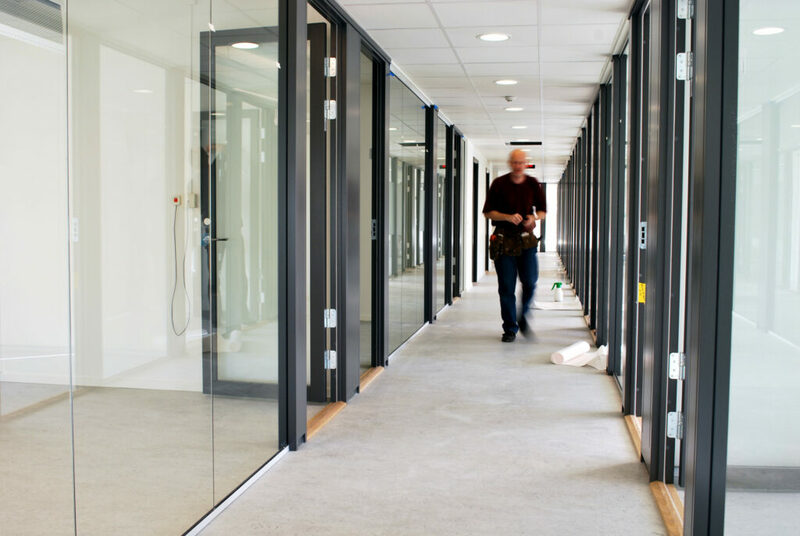 Take a look through our gallery to see how our paint jobs have brought new life to commercial spaces and contact us if you would like the same expert service. Best Value Home Remodeling: Which Renovations Will Increase Value? A WordPress Commenter on Why Do Paint Contractors Offer Such Different Bids On a Project?